Home »Uncategorized»Whose Sin Is It, Anyway? 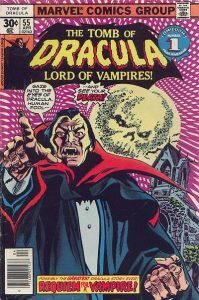 Dare You Enter… the Complicated Moral Question of Dracula? One thing I’ve always been skeptical of in vampire media is the idea that vampires are better than you. There’s a certain tendency to present them as glamorous immortals. And that’s particularly true when you gloss over — or simply aren’t bothered by — their violent and cruel behavior. I had a gig once where one of my bosses was very determined that vampires should be presented as possessing all desirable material things… and within the fictional context of the world we were working on, he saw the violence and abuse as window dressing, the appropriate action of the powerful over the powerless. For me, the core story of vampire-as-protagonist is about selfishness. Vampires represent our inability to survive without selfish actions, and throw into sharp relief the fact that putting ourselves ahead of others can be very harmful… but also necessary. In vampire media, we need to always ask the questions of what is justifiable, what is acceptable, what is reprehensible… and be willing to entertain answers that make our monsters neither angels nor devils. Next → Next post: Patreon for new games! Just have to comment to say STRONGLY AGREE!! For me, the best vampire stories are the ones where the mortal is consumed with the lure of immortality and power, but finds that it all turns to ash when they have to pay the price. That living forever at the cost of innocent lives erodes not just your conscience, but your sanity. But the same people willing to make the deal in the first place are the sort of people who can’t let themselves die, no matter how horrific the price becomes.